I decided on accessories. I made the hat from a Japanese pattern that I found accidentally one day (email me if you like it and I will try to send a PDF or find the direct link to the page with the pattern. The site I found it on is in Japanese and was hard to navigate unless you read Kanji). 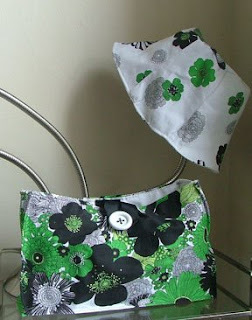 The purse is my own take on the clutch bag you can find in the Quick Stuff to Sew Spring issue. I liked the original pattern but I like my bags to stand up on their own so I did some top stitching along the bottom and sides as well as sewed in the corners to give it shape and believe it or not, used tulle instead of interfacing to get the stiffness. It stands nice and tall now. 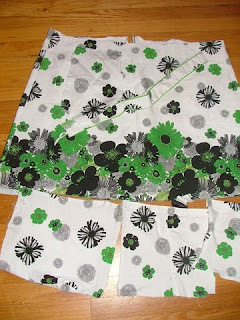 I have enough fabric left over to cover a pair of flip flops but flip flops haven't hit the stores yet around here. After that, all I will need is a white framed pair of Jackie O sunglasses and I will be good to go.